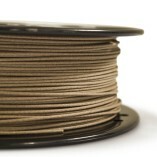 You can print with wooden filament. Wha? Yes, and it’s awesome. We just got this in and will be posting some pics later of some of our wood prints. 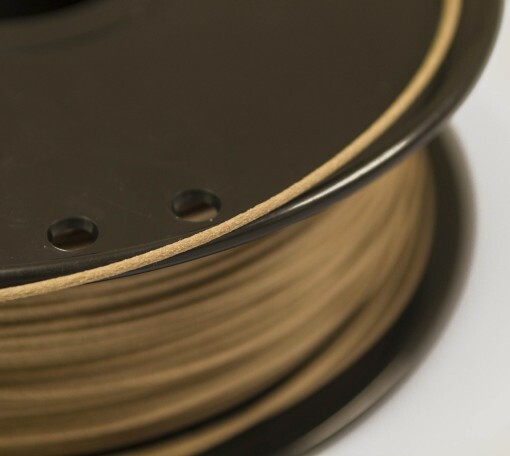 This filament is PLA based, which means most PLA-OK printers can handle this, as long as you get your temp and speed settings correct. 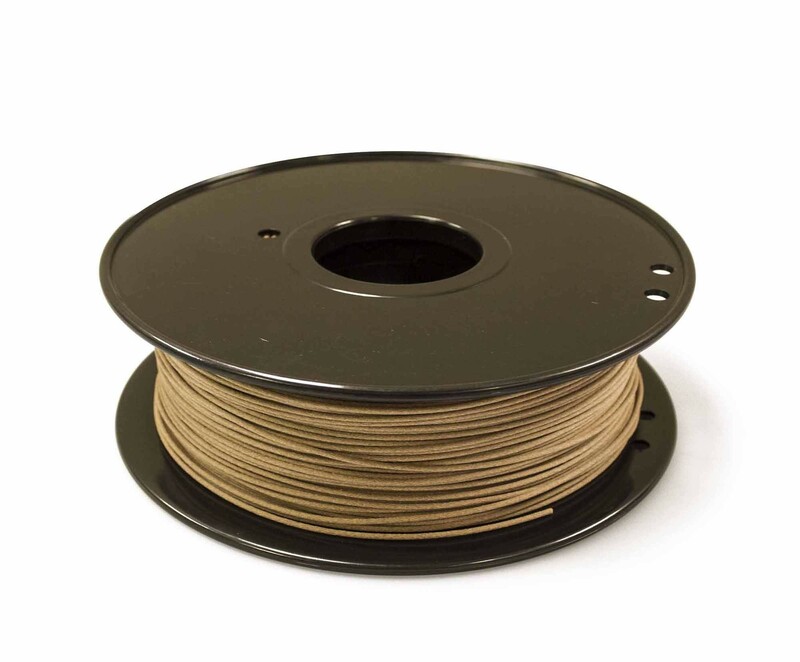 Once printed, these filaments can be sanded and even stained. temps: we recommend between 185-215, but check with your printer manufacturer on this. Why the large range? Well, the extrusion temperature can affect the wood tone and color. Play around with temps and see what you get. speed: print these fast. It may seem counter-intuitive, but if you print too slowly the resins in this filament can liquify and clog your extruder. 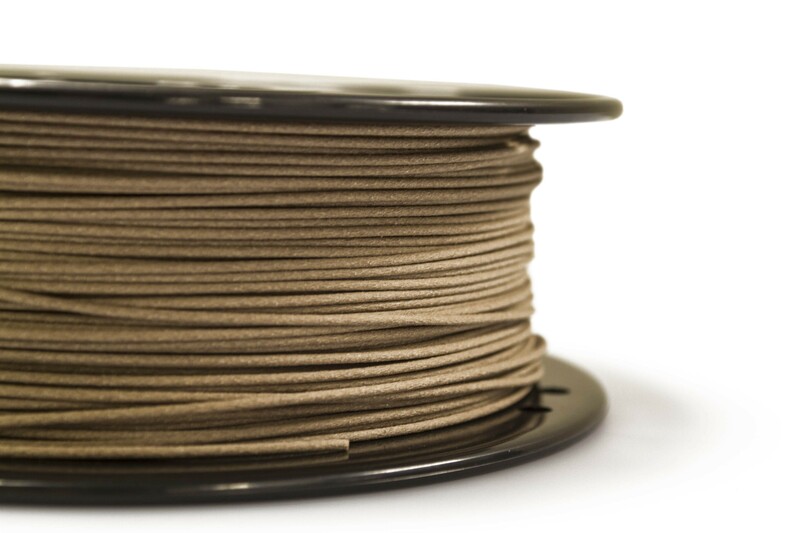 Wood Filament Note: check with your printer manufacturer before printing with wooden filaments. 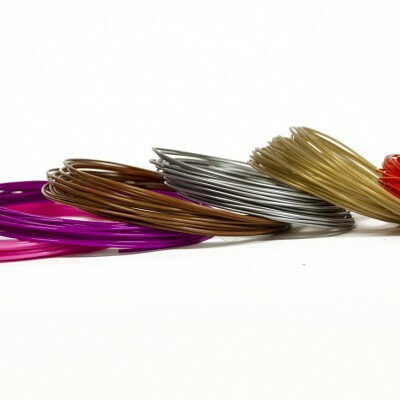 While most printers can handle the temperature and bed requirements, some stepper motors choke on the the resin that these filaments contained. 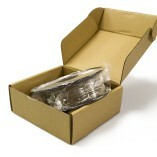 They can also recommend specific speed and temp settings for your equipment. 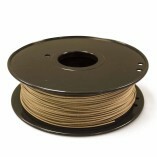 Note: We’ve had two reported instances of filament either charring or, in one case, actually catching fire. Please ensure that your nozzle can push this filament through fast enough that resin does not build up inside the hotend. 5mm is going to give you the best results. 4mm might be OK, but test it first before printing a job you walk away from. 3.5mm might burn your house down**. This is real wood. Wood resin + a 200 degree hot tip = hot melting wood. If you’re careful, it also = awesome, but please test several times to make sure this is going to work with your printer before getting lax on this. Thanks and stay awesome. ** We don’t cover burned houses, burned printers, burned pinky fingers, burned leather couches, etc. Print at your own risk. It’s like owning a dog that is 1/2 wolf and 1/2 pug – a bit extra awesome vs. a standard pug, but be careful. Worked great in my Printrbot Simple Metal. I used 185C for the extruder and 50C for the bed. No other adjustments necessary. 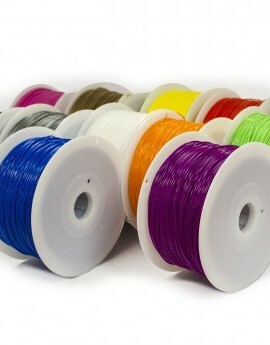 Great filament, if you want your hotend to catch fire. Printed at minimum tempature, and pow, fire, completely charred filament all in the hotend. 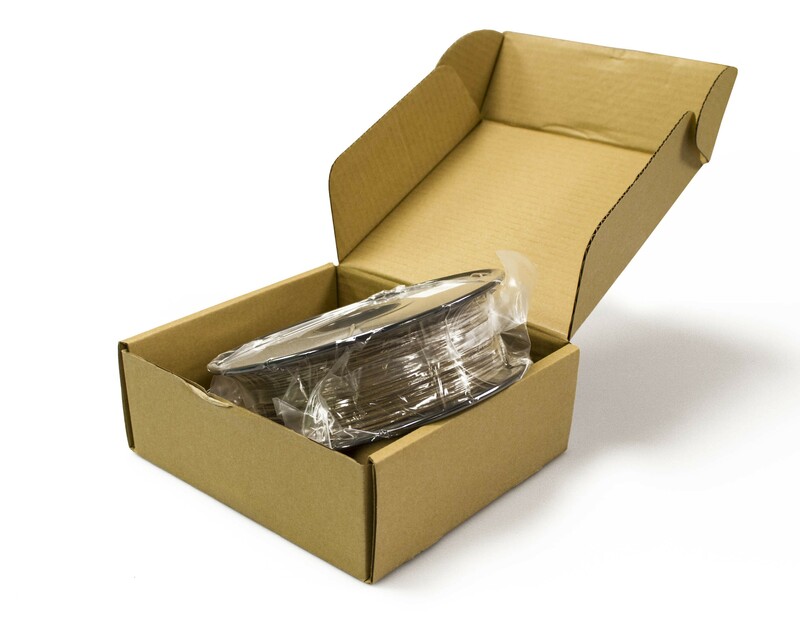 If you’re having issues with our filament, please contact us directly using the support@thefoxsmart.com email! We’ve never heard of fire from a hotend (either from our filament, or any other brand, for that matter), but we want to make sure all is safe and well. Let us know how we can help! I attempted around 10 prints with this filament. Only one ended up successful all of the way through. The problem I had was that the filament itself would either snap or strip on the extruder hobbed gear. Meanwhile, the printer (Rostock MAX V2) continued happily along while printing nothing. I tried a number of settings to fix this, with no luck. Printed all of the way down to 10mm/sec (normal print speed for a delta like mine is closer to 35-45mm/sec). I contacted Foxsmart through the form several times asking for advice and never received any response. 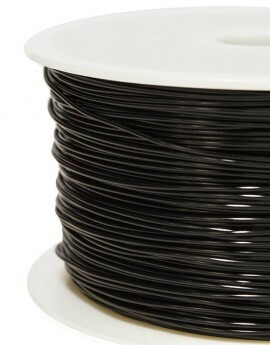 Their PLA is good, but this filament as well as the customer service response was quite poor. I have almost a full roll of this that will likely never be used. Maybe I am printing too hot but this filament can just stop extruding mid print. This is unlike my other PLA roles. But when it does work is looks pretty cool! 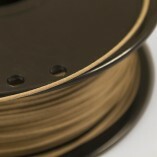 This being the first FoxSmart filament I have used I love the quality over Microcenter’s Inland brand. Ok, i gonna have to say .5mm tip[ is almost a MUST with this stuff! i had a .4 on 6 months ago, gave it up, put .5 on for their metal filament got that going great so decided to give this a try again, WONDERFUL! 200deg tip, 60mm/s 50deg bed .5mm tip. Oh, dont let 200deg sit in hot end it will clog the hot end fast! but if you loved wood shop it smells amazing! I had constant clogs with a .4mm nozzle. As soon as I switched to .6mm it printed flawlessly on my Duplicator i3 at 210 degrees. Very happy with the filament and the pricepoint is great, too. Totally agree with the review above – could not print with a .4mm nozzle without clogging mid-print regardless of what settings I choose. I switched to a .6mm nozzle and it works beautifully with no fuss at all. TRY A LARGER NOZZLE if you’re experiencing clogs.